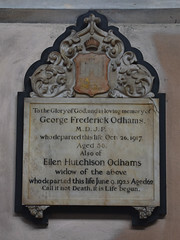 Norwich has more redundant churches in its centre than just about any other English city, but there are still a number of working Anglican churches, perhaps more than many people realise. St Andrew for instance, which is kept locked from one end of the week to the next and to all intents and purposes appears abandoned, is actually still in use. 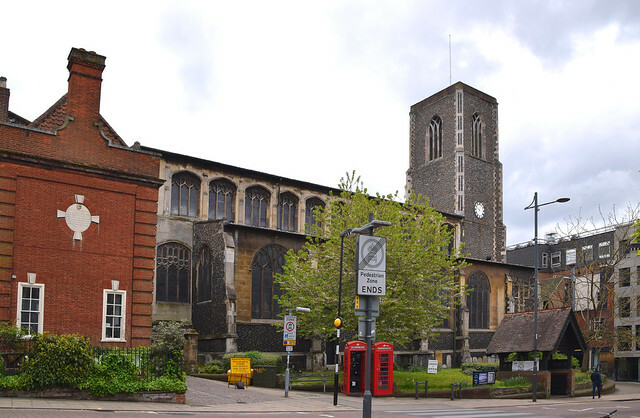 St Andrew is one of the most visible of the city's churches, especially to anyone who drives through the middle of Norwich, its north side grand and majestic opposite the Halls. The other three sides are hemmed in by shops, and the great uncrenellated tower is a landmark appearing and disappearing behind other buildings as you wander about the Lanes at the pedestrianised heart of the city. In fact, the north side was hemmed in as well until the 20th Century, when the buildings in front of it were removed to widen the road for trams. 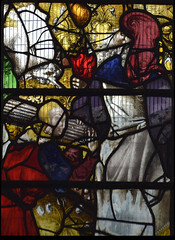 St Andrew is the product of late medieval industrial wealth and piety. 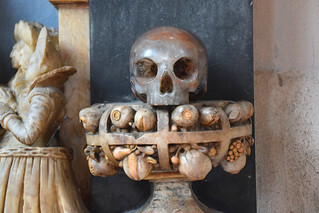 It is not quite as late as St Stephen, but it was built almost entirely in one campaign from the 1470s to the first decade of the 16th century, making it contemporary with the great church at Southwold in Suffolk, with which it has some similarities. The tower came first, and then the great unbroken line of nave and chancel. 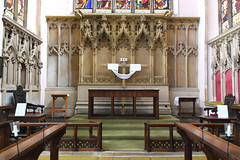 As is common for the period, there is no chancel arch. 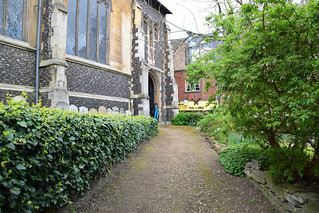 Entrance today is usually through a small porch set into the most westerly bay of the north aisle, although in fact the grandest entrance is through a south porch, now hidden from the street. The west doorway is blocked off by a room built beneath the tower, and always seems rather scruffy seen from the passageway which runs to the west of the church. 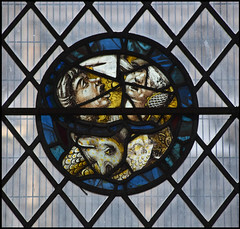 We are in the full flight of Perpendicular architecture here, for although St Andrew is ostensibly a church of stone, there is very little of it in the construction, because the aisles, the clerestory and the chancel are virtually walls of glass. The way that the arcades fade into the east end, and a high window rises above them, may recall the smaller church at Shelton. 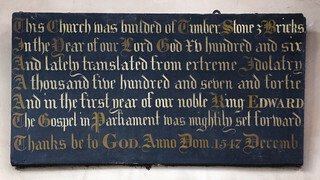 The team that worked at Shelton are believed to have worked on the final stages of St Andrew. 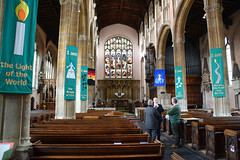 As with many of the Norwich city churches, St Andrew has been overwhelmingly Victorianised, and the interior is very much a 19th century idealised urban vision of what the late Middle Ages might have been like, refracted through the lens of St Andrew's muscular low church worship, a tradition it maintains. It was done well, and might best be described as sumptuous. I wonder who the architect was? 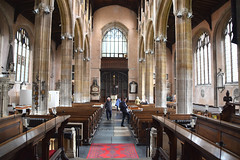 It may have been Diocesan architect Richard Phipson, who made a bit of a hash of St Stephen, but he was on good form at St Peter Mancroft and was glorious at St Mary le Tower in Ipswich. 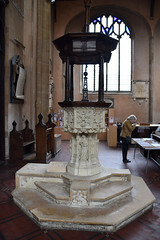 Whoever it was, they left one of the most ornate 19th century fonts in Norfolk, and far off to the east a reredos to match. In between, the church unrolls before you. As at St Stephen there are massive 18th and 19th century memorials set between the windows of the arcades, but they are rather less oppressive here, perhaps because the church is bigger and there is more light. 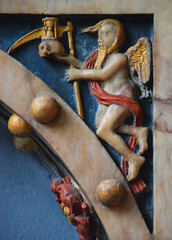 Set up in windows towards the west of the south aisle are some fine, large medieval panels, one of which comes from a Dance of Death. 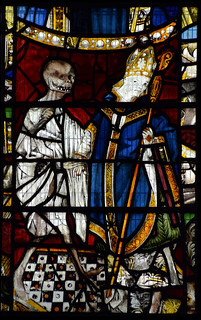 It shows Death dancing with a Bishop. 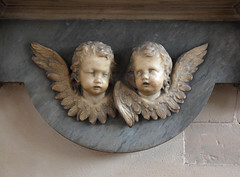 Another is a composite of bits of angels. Some of them are musicians, and one of them is holding a scroll saying salve nos. 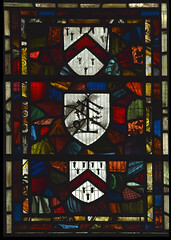 Perhaps even more interesting is the collection of 16th Century glass to the east. 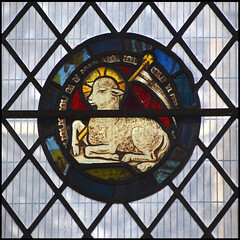 This will instantly recall for anyone who knows it the glass of the same period at Kings College Chapel in Cambridge. 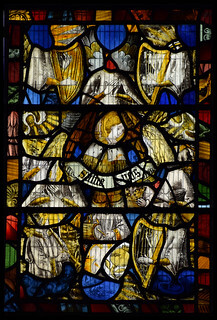 The glass there was made by Flemish glassmakers working in England, and it is fascinating to think that the same may be true here, especially given the role played by Flemish workshops in Norwich's proto-industrial revolution of the time. 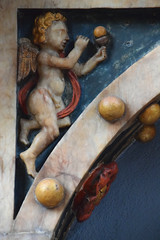 There are two panels of collected and reset fragments of scenes from the Books of Genesis and Exodus. At the bottom on the left, Isaac faithfully carries the bundle of sticks behind Abraham to the place where his father plans to sacrifice him, while above Lot flees the already burning city of Sodom. 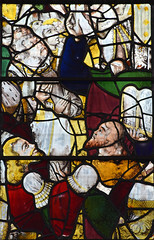 On the right, at the top the serpent slithers through the Tree of Knowledge, while below Moses descends from the mountain to meet his people. 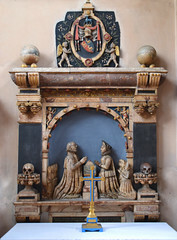 Another medieval survival is a scattering of brasses, one a pair of figures in the sanctuary to Robert Gardiner and his wife. 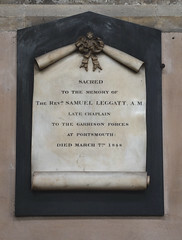 He was mayor of Norwich on several occasions during the building of St Andrew, and died soon after its completion. 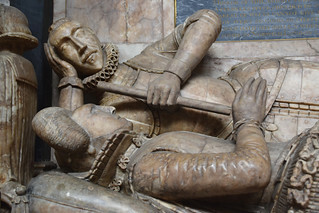 His wife is particularly elegant - both figures are flatteringly young for their age of death. 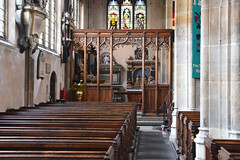 Whoever restored St Andrew in the 19th century relegated the large Elizabethan and Jacobean monuments to the north aisle chapel, where they are concealed by a Victorian screen. 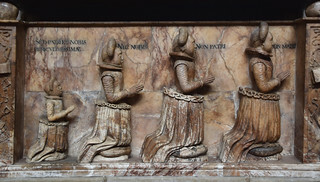 They are the grandest memorials in the city, and show several late 16th and early 17th century mayors of Norwich with their wives. 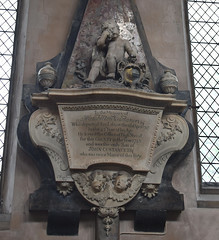 The biggest is to Sir John Suckling and his wife Martha. Mortlock notes that he was James I's treasurer, and also observes that the figures look stiff and uncomfortable. 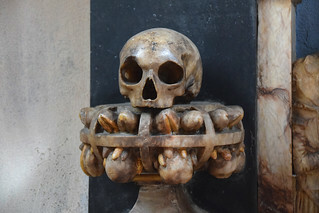 His parents face each other over a prayer desk on the eastern wall, flanked by some delightfully ghoulish skulls mounted on cages of decaying fruits and flowers. In between the two there is a memorial to Francis Rugg, also three times mayor, who was a Senator of Senators renowned race. 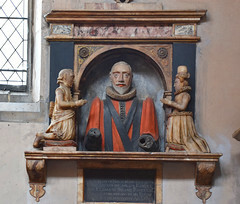 Robert Garsett, another mayor who died in James I's reign, is the most endearingly lifelike, despite the loss of both hands which may suggest for one moment that a cruel 17th Century punishment has been imposed upon him. A thousand five hundred and seven and fortie. I think that panels like the first one must have once been more common, and that this is a rare survival. 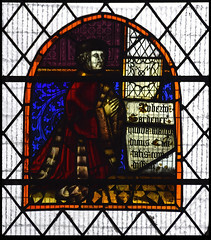 It is a reminder to us that the Church of England nearly didn't exist at all, for if Edward VI had lived into adulthood and had gone on to impose all his ideas, then there would have been no more Bishops, no more sacraments, and we would all have become presbyterians. 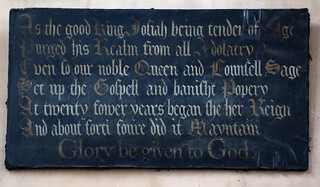 The second panel is even more interesting, for it was obviously placed by members of a puritan congregation after the death of Elizabeth, to flag up their concern that the incoming James I might have been more tolerant of those evil, treacherous, sulphur-breathing Catholics. Of course, they needn't have worried. 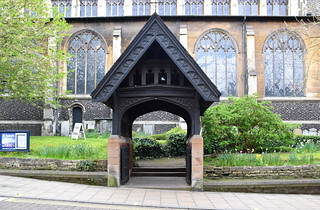 Norwich is not great for open churches compared with neighbouring Cambridge and Ipswich, both places where the majority of working churches are open every day, and those that are not are accessible. That St Andrew is not so easy of access as some of its East Anglian urban counterparts is a shame, for this is a church which is really worth seeing inside. I can't help thinking also that it would be a great act of hospitality for shoppers to be able to step out of the busy crowds into its cool, light interior. This is currently not to be, however, and you are most likely to find St Andrew open for a special event like Flintspiration or Open Heritage Weekend. Because of this, you will probably find people already exploring the church, perhaps in guided groups, which makes it rather hard to wander aimlessly at will. Stewards on duty are generally swift to find you and explain things to you. It is nice that they are so interested and helpful, but I do sometimes get the impression that people like this think they are doing us a favour by letting us in. And I think that, even moreso than at St Stephen or St Peter Mancroft, this is a church in which you'd want to sit quietly for a while, perhaps completely on your own, and experience a sense of the numinous. Hard to do with someone tapping you on the shoulder and asking if you want a cup of tea.